In 1994 I wrote a script for a twenty eight minute video. To produce the video it cost me $10,000. The video generated over $120,000,000.00 in revenue. Yes, that’s millions. Approximately 20% of that went directly into my pocket. If you are a writer, blogger, podcaster or producer you need to read this article.If you haven’t figured it out already, I wrote an infomercial. Before you scoff, before you dismiss me and skip this article let me ask you a question. If you knew that people would pay you based on their level of enjoyment of your content would you survive the cut? The more they liked you the more they paid. The less they liked you to less they paid. What if they hated you and you had to pay them? That is the cold, hard truth of how the world really functions.I must admit, I have a very unfair advantage. I am a hypnotist. Not just any hypnotist. The media calls me the greatest hypnotist of all time. I know how the mind operates and I know what causes a person to do what they do. I not only hypnotized my wife to fall in love with me I also hypnotized her to give drugless, painless birth to our two sons at home in the bath tub with no doctors present. When I write copy I hypnotize people to buy my products and when I speak I hypnotize people to run to the back of the room to invest in themselves and my programs.I am very up front and honest about it. My wife will tell you she knew I hypnotized her from the moment we met. She will tell you she’s glad I did. My fans and customers keep coming back for more because their lives have been made better by what I hypnotized them to buy. I hypnotize my son’s on a daily basis to adjust their behaviors so they can live a more full and joyful life. Everybody wins. Media, whether terrestrial or digital is one of the most hypnotic forms of communication on the planet. With so many choices in media both online and off, it’s essential that you structure your content in a way that not only keeps your audience engaged it also must cause them to take a new action. Whether it’s buying your products or visiting your advertisers sites, or taking some new action. When I created my infomercial “Passion, Profit and Power!” I knew that I wasn’t only competing with other infomercials. I knew I was competing with all other TV programming. I knew I was competing with print, radio, board games, and any other activity my consumer could choose. You see, the human condition is such that it will always choose the path of least resistance. That’s how people form habits that they know are horrible and still have such a hard time stopping. All buying decisions are based first on emotion and then backed up with logic. A buying decision isn’t just the choice to make a purchase. A buying decision is any choice. Choosing to subscribe to your blog, choosing to recommend you to friends, choosing to come back again and again are all buying decisions. If you adhere to a simple formula, you will dramatically increase both your audience and your revenue. I call the formula “E3”. Entertain, Educate, Empower.First Entertain. Funny means money. The highest paid television and movie actors are always comics. Laughter and the joy it brings are highly desirable experiences for most healthy people. When you can make someone laugh you will hold their attention. At the same time any emotional experience will engage people and keep them engaged since human beings are motion junkies. In my infomercial I showed clips of people walking on broken glass, breaking bricks with their bare hands, eating fire and getting hypnotized to do the most amazing things. I knew if I created a show that they would come back and watch again and again eventually they would buy from me.Second Educate. To be an authority you must establish competence. Give your audience useful knowledge that they can not only use, give them information that firmly positions you as an expert. If you don’t believe that your material is content rich enough, come see me, there’s a hypnotist for that.Thirdly Empower. If they are simply entertained and don’t take a new action then you are missing the mark. To create evangelical customers, fans and followers you must alter, add to and improve the quality of their lives. What’s the outcome? What’s the new habit or action? Did you empower them to change their lives, buy your product or spread your message to others? If so, grand slam, out of the park, home run. I will be entertaining at NMX LIVE! on Saturday night at 8pm. My hypnotic show will have you laughing until you hurt and gasping in amazement. On Sunday at 4:30pm I will be keynoting and teaching you how to massively monetize your online content and more. Plus I am going to be giving away tens of thousands of dollars in cash and prizes. See you at NMX LIVE! On the Tuesday before Thanksgiving, Google Hangouts On Air host CoachDeb gave the NMX audience some podcasting ideas to be thankful for. As always, CoachDeb is joined by esteemed experts in the digital media creation world. This broadcast centered around three very influential podcasters who have consistently attracted a wide audience, and the casual informative discussion builds upon Deb’s previous podcaster Hangout from the week before. The Hangout guests for this broadcast were Dino Dogan (Founder of Triberr), Greg Hickman (Founder of Mobile Mixed )and Caleb Wojcik (Online Entrepreneur, Think Traffic, Fizzle.co & Caleb Wojcik Films). It was the first evening Hangout, and we see CoachDeb starting out in the sun’s spotlight – and signing off in the early moonlight! Dino Dogan started us off talking about why he founded Triberr. He initially was inspired when he saw a number of tools that helped one promote themselves to an audience – but sought a tool that could connect everything. Greg Hickman, from NJ, founded Mobile Mixed which started as a video based interview show primarily with people he was interested in meeting. He now incorporates solo episodes focused on training people in the area of mobile marketing. Caleb Wojcik co-hosts the podcast he piggybacked off his Fizzle training platform. When CoachDeb went fishing for podcasting tips, she caught some prize ones! The panel’s answers gave the NMX audience some very creative ideas, practical information, and shed insight into how these renowned podcasters think. In the content creation area, Dino shared that he had the idea to interview TED speakers during their preparation time – and then put up podcast at the time of their TED presentation. His podcast rode the wave of the guest’s TED platform appearance and thus created a larger ocean of listeners. Greg shared his technical area podcaster tip, and it is a very important one: the microphone! Yes, your mic is the connection between you and the podcasting audience, and this audio component should not be compromised. He suggested a condenser microphone over a dynamic one, and that the podcaster should use one that does not pick up a lot of room and background noise. No one really wants to hear motorcycles going by, or the dog yapping in the hallway! Decent mics suitable for podcasting are available now for under $100. Greg’s choice is a Heil microphone that can be purchased for $200-$300. Listen to this podcast and hear the difference it makes! (The rest of the participants were very jealous – and heading for the store immediately afterwards). He also suggested to the hangout audience that podcasters and those wanting to start podcasting search for technical tutorials online. NMX 2014 – What Will Podcasters Be Talking About This Year? CoachDeb asked the podcasting participants – who are all scheduled speakers at NMX 2014 in Las Vegas – to give the Hangout audience a peek into what they will be talking about this year. Greg Hickman is making his presentation on mobile content marketing strategy. All content ends up on mobile phones, and he will be expressing the major importance of using mobile to leverage your content in a user friendly way. Caleb Wojcik will address the NMX 2014 audience about how to make a small investment in equipment to make great looking and sounding sessions. He has done much research and experimentation, and will clearly explain how to get the biggest podcaster bang for your buck. Dino Dogan will be bringing his a-game to NMX 2014 with a talk on influence marketing and crowd sourcing. He will give a taste of a new endeavor he is in the process of launching that involves a brand creating a kick starter type campaign – but instead of raising money, they will raise the active involvement of content creators. Instead of hiring one celebrity spokesperson to promote the brand, Dino’s concept is that a brand can hire hundreds of influential bloggers. The compound results will move the needle. But the question is – how to manage this? He created a way – and will be going live with it next year. Dino will be talking about the principles of it at NMX 2014. Dino – likes to hangout at NMX and meet people and he has built some amazing relationships. Caleb had an interesting suggestion. He said to find a couple of people that you know ahead of time and connect with them and see who THEY know – you can build up relationships that way. Have your friends who are also attending NMX introduce you to others there. Deb told the hangout audience to search NMX handles and hashtags on Twitter and start engaging and interacting a month before the event. At a past NMX, Greg said he went there primarily to meet Pat Flynn. Previously, they exchanged emails and Greg had Pat on podcasts. Pat recommended that Greg go NMX – and he was so glad he did, because through Pat, he met lots of great people there. NMX started as BlogWorld and made a transition to encompass all media – and the media revolution is ongoing! CoachDeb asked her Hangout panel about current podcast trends. Caleb definitively stated that podcasts will not go away because they are strong personal connections. They can’t be skimmed over like a blog post. Your podcast fans listen for 1/2 or hour per week (or more), and that’s why he felt that podcasts were best way to get in front of people, and to get their focused attention. Dino added that the human voice creates a powerful connection. People get obsessed with podcasts and become big fans. Greg summed it up best by saying that you can intimately get inside someone’s earbuds with your podcast! Dino Dogan: Do intro music and introductory voice over – do it right & make it really good! 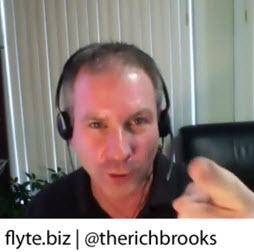 Greg Hickman: Don’t stress out about numbers – find your own niche whatever the size is and realize that subscriber numbers fluctuate. Caleb Wojcik: Look outside of your own topic area – see what other podcasters are doing that are fun and different and see if you can incorporate that in your own podcasts. NMX and host CoachDeb are dedicated to bringing the NMX Hangout audience the best of the best – casual inspired conversations with people you admire as leaders in their new media areas of expertise. They all want to hear from you – because like them – YOU are part of the media creator community. Don’t forget to watch your email to learn about the next Hangout – and if you aren’t on our email list yet, sign up now on the sidebar so you don’t miss any of our upcoming special guests! On the first of many more to come, New Media Expo (NMX) was very excited to interact with Web Developer and avid Google Hangouts On Air user Jason Tucker. For over a decade and a half, Jason has been a hands-on developer and systems admin in a wide variety of fields from entertainment to health care. In our first chance to Hangout on Google, CoachDeb Cole, NMX Marketing Director, asked Jason pertinent questions regarding hosting and participating in Google Hangouts On Air. It all starts with using the right equipment. CoachDeb and Jason discuss some specific equipment and apps that he uses and recommends, for a high level experience during a Hangout session. The cost is minimal, but like everything – you have to have the right tools for the job! Jason stressed that Google Hangouts change all the time and it is often difficult to keep up unless, like him, you Hangout every day. However, once you are comfortable with the basics, you will be able to identify most of any recent Google updates to the platform and figure out how to use them effectively. CoachDeb has asked the buring question – when you are hosting a Google Hangout On Air – where do you look with your eyes? You want to look directly into the camera, but you also have to address your screen to see others as well as the Q & A’s and other on screen info. Because of all his previous hanging out experience, Jason had some valuable insight to solve this dilemma. CoachDeb summed it all up at the end by expressing her excitement about combining social media and digital broadcasting, and Jason expanded on this by inputting additional creative Google Hangouts On Air possibilities that include multi-camera Hangouts and apps to help push your broadcast to a higher production value level. So jump in and Hangout with us at NMX for this archived initial broadcast, and join us for future live Google Hangouts On Air. JASON TUCKER: Hey how you doin’? COACH DEB: Very good, thanks for helping us out as we set up the first Google Hangout for NMX! JASON TUCKER: Yeah, no problem at all! COACH DEB: So for anyone watching us live, this is going to launch our Google Hangout series with New Media Expo, and since I didn’t just want to talk to myself, Megan, our social media manager, introduced me to Jason who’s been super helpful in some of the little logistics – since Google Hangouts seems to change all the time. I think the last Hangout I did was like a month ago and I came in and you said like the tools – they change all the time! JASON TUCKER: All the time! Yeah. Yeah, they’re constantly changing, lower thirds change, the interface itself changes, tons of stuff changes on it. COACH DEB: How do you keep up? JASON TUCKER: I do it every day! COACH DEB: Well, that’s a good way to keep up with everything! COACH DEB: Share your website ‘cause you – for anyone watching us live just happen to catch us here as we test out the whole system, it’s gonna be hopefully a two minute video but maybe it will be practical. Share your website and the link that I just went to with the Logitech, it was the ‘want to be amazing at recording live events here’ – and then if you could show our listeners, viewers what Logitech camera you recommend so that when speakers come and present to us and the audience of NMX they’ll know how to look like a pro! JASON TUCKER: Sure. So if you go over to the website, http://wpmedia.pro you can take a look at the links there. There’s a search box you just type the word Logitech in there, you can see the posts that relate to Logitech. The Logitech camera that I use is the Logitech C910 – it’s this little guy right here. It works on your laptop so you could just sit it on your desktop or laptop, it opens up so you can get a nice little connection behind the monitor there and you can adjust it as needed. It has a – I think it’s like a 200 and something degree angle for the recording of audio. It also has this really great thing on the bottom here so you can actually mount it to standard tripods, so if you have a tripod for you camera or something you can use it on that. So if you go to the website you can click on that. They sell it over at Amazon for 145 bucks. So that’s the Logitech HD Pro Webcam 910. COACH DEB: Very cool. Thanks Jason. The other thing too, as you’re talking I’m like I actually want to ask a couple of other questions about having your speakers do cool Google Hangouts. I noticed when anytime I’m participating in a Google Hangout I want to watch what they’re talking about – the speaker – on the screen, but then it will catch you as you’re interacting like I’m talking to you here because I see you, but then other people watching the broadcast they’re seeing it from the camera. So where do you recommend looking as far as you position your website browser somewhere – near your camera? Um, just go back and forth? What are some of the recommendations that you do? JASON TUCKER: Yeah, there’s actually a great tool in the Google Hangout called Screenshare. And if I click on Screenshare and then I tell it that I want to display a particular website I can click on this and it will take you straight to that page so you can see the page there. From there you can move the mouse around on the screen, move everything around on there. You’re able to see that with no problem. After that you can switch back the camera and then you can talk again. So it ends up working out really well for that. Being able to share your screen and to also share what’s happening with you on the camera. Were you able to see my screen while I was doing that? COACH DEB: Yep, very cool! JASON TUCKER: There’s another thing if you’re using a Mac, this is also a pretty great way of tying everything together. There’s a great program called Picture In Picture. It’s called PIP2. And what you can do with PIP is you can actually do a picture in picture screen – so you can see me on my video and then you can also see – I think you’re seeing yourself now. JASON TUCKER: There we go – but I can switch the camera and you can see my video on the bottom corner here while I’m talking, and then you can also see the webpage too. COACH DEB: That’s scary – what’s it called? JASON TUCKER: That one’s called PIP. PIP2. COACH DEB: What are some of your other favorite apps? Since this is going to be a very practical video, I like this! I’m glad you came on – or I’d just be talking to myself! You can’t just Hangout with yourself! That’s just wrong! What’s one more tip before I let you go? And then you’re gonna be on our first Google Hangout! JASON TUCKER: Oh, that’s awesome! JASON TUCKER: Let’s see here – the favorite tool that I would use? I use this really great program called Boinx TV. B O I N X TV. It’s around 300 or so dollars for it, but what’s great about it is you can actually do pre-productions stuff with it on the fly! So you can actually run your own little TV station, have lower thirds on the bottom, have a Twitter interface on the side, kinda do all those sorts of things. So there’s a trial you can download and check that out, and then you could pay the full version if you wanted. What you could do with that is you could actually have it displayed and have your video on there have all these different interfaces and stuff around kinda CNN style, but then use Google Hangout to use their screen sharing feature like I was just showing you and display that CNN looking screen instead of the actual video that we are actually recording here. So it’s a cool way to kind of tile these pieces together. And maybe when we talk actually talk again I can show you that stuff. COACH DEB: Cool. I’d love it thank you. What you are describing is like you said CNN style – that’s exactly what I was thinking, it’s truly broadcasting at its best where it’s integrating social media with traditional broadcasting where everything is at your fingertips – and it’s a pretty exciting time to live! JASON TUCKER: Yep – and if you have multiple cameras that’s the way to go ‘cause you could do video tutorials and all sorts of stuff with having a camera above you a camera in front of you a camera at the side and kinda flip cameras just by pushing buttons on the keyboard. 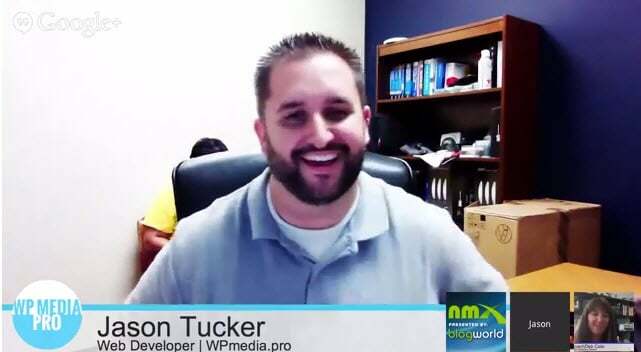 COACH DEB: Well thank you Jason Tucker – and it’s @jasontucker.com? JASON TUCKER: @jasontucker on Twitter and http://tucker.pro/ is my website. COACH DEB: Ok I just followed you on Twitter so you’ll see a CoachDeb following you and I’m gonna stalk you now for everything to do with Google Hangouts! This is awesome. JASON TUCKER: No problem at all – I’m glad I was able to help you out. COACH DEB: And for anyone who is watching this random Google Hangout what happened is the NMX team is behind the scenes with DragonSearch – they’re actually here they’re just kinda hidden. And they’re helping us with the Google Hangout system and setting it up so we don’t have any glitches when our first speaker comes on. And Megan said we need to test this with someone who is not an admin account because, Jason, what was happening is all of our team members were coming on so we had five people coming on all coming up with the NMX logo instead of their picture. So the only time I would come up and I would talk and like when I would hide my video like this – I think if you still hear me – so now you just see the picture and the audio broadcast and I was getting a kick out of it. But I’m like but now I wanna see someone else do it! So when DragonSearch would start talking the little green icon would come on – these things are just fun sometimes these new tools but with them we become the guinea pig right – we have to learn all the different features that change every day I think it’s like the good and bad with it! JASON TUCKER: Exactly I mean you can get pretty crazy they have special Google effects so you could actually put a crown on you if you want make yourself like a clown if you like. COACH DEB: We’ll just be clownin’ around while we’re Hangin’ out! JASON TUCKER: No problem – you can go pretty crazy with it! COACH DEB: I love it! Thank you so much Jason for Hangin’ out with us. Aloha! And for those of you tunin’ in right before we shut down, go check us out when we’re being serious and hopefully you got some cool tips if you’re thinkin’ about doin’ a Google Hangout – go to www.nmxlive.com and check out the show that is going to be coming at you in Vegas live with 3000 to 4000 people all in the new media industry from blogging to podcasting to web TV to social media business. Go ahead and check it out you’ll see a video there and all the information and the sponsors. And then DragonSearch thanks for helping us with the admin, I’ll let you turn this off and any last thing Jason to give to our listeners. JASON TUCKER: Nope – I’ll see you at NMX! COACH DEB: Perfect – see you then! Take care.